This is a quick and tasty side dish that is also very healthy. While I used the Power Greens from Costco, you can use any greens you like. In a large saute pan, add olive oil and onions and brown. Add your greens a little at a time until the greens wilt. Once all your greens are in the pan, add your garlic and rice. Cook for a few minutes to incorporate all the rice. 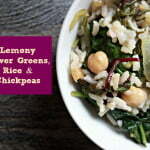 Add your lemon juice and chickpeas and continue to cook for 5 minutes.